Friday and Saturday should be pleasant across the Finger Lakes, but Sunday looks stormy. 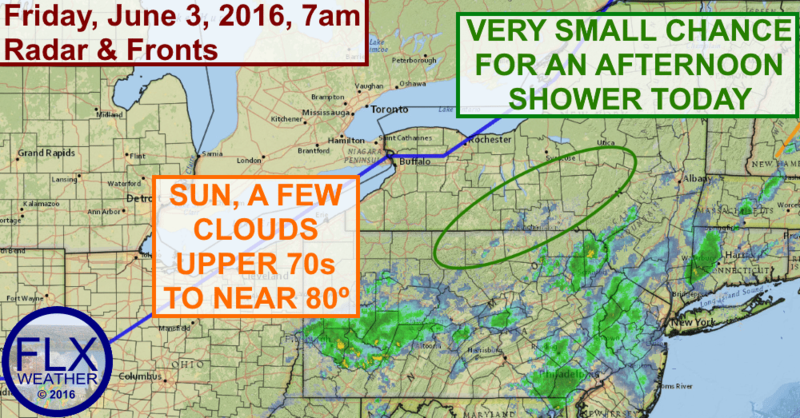 Precipitation ahead of a weak cold front pushed east of the Finger Lakes overnight. While some clouds still linger over the eastern Finger Lakes this morning, sunny skies are dawning further west. Sunshine should overspread most of the region this morning, with some fair weather clouds developing during the afternoon. There is a very low chance for a couple of pop up showers across the southeastern Finger Lakes this afternoon. Most likely this will not happen though and the entire area will stay dry. Temperatures will top out in the upper 70s to near 80 degrees today with comfortable humidity levels. Clouds will increase tonight ahead of our next storm system. Some breaks of sun are still expected on Saturday, especially early in the day. The forecast certainty starts to falter a bit by the late afternoon as moisture increases from the south. The most likely case is for everyone to stay dry until after sunset on Saturday, but again, there is a slim chance for some rain to move in a bit earlier for southern parts of the region. Temperatures will mostly be in the upper 70s on Saturday. A batch of rain and thunder is likely Saturday night as a warm front lifts north. The rain will start as showers during the evening hours and spread north across the remainder of the area shortly after midnight. Locally heavy rain and thunder will become more widespread during the early morning hours on Sunday before it lifts out sometime during the morning. How quickly this rain moves out, and how far north warm and humid air make it, will determine the remainder of Sunday. Should the rain and clouds linger, and temperatures remain cool, Sunday afternoon will likely feature showers, maybe a few thunderstorms, and maybe one or two stronger storms. However, if the sun breaks out and temperatures warm, resulting in an unstable air mass, conditions would be favorable for all modes of severe weather, including some tornado threat. The severe weather threat remains very uncertain and will likely remain uncertain until the weather unfolds on Sunday. Continue to monitor the forecast for updates. The low pressure responsible for this threat will hang around into the middle of next week, keeping the area cool and showery.